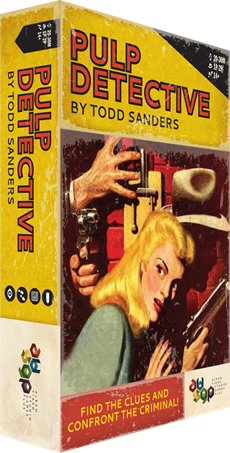 Take a role of investigator and try to solve the case in a desperate race against time in Pulp Detective - new solo dice game by Todd Sanders. Pulp Detective is a dice narrative game that takes place in the middle of the 1930s, the golden age of pulp magazines and hardboiled movies. Find all 4 clues, and if you still have time and stamina, confront the criminal in the final showdown! Match the icons, solve the Case, and win the game! A case for this game is already made on Kickstarter, so go check it out.